With money to tight to mention! With money to tight to mention I was looking for a way to get some heat and still spend the time outside in the garden after looking on Done Deal for a garden heater I came across this guy selling these heaters for 155 euro and I thought I would have a look first on the net elsewhere, a friend told me to take a look at our friends in woodies they were having a sale and they have what I was looking for . So this afternoon I headed off to Carrigmines to Woodies and low and behold they had one last Terracotta Chimnea Burner for the princely sum of 39.99 Euro . The Box said the normal price was 84.99 and the early bird letter says 64.99 Euros in any case I got it for 39.99 and I am happy with that! They should be getting more next week for those of you that want to get your hands on one of them .By the way the guy selling these on Done deal is possible getting these from Woodies and selling them on to people on Done deal! So here is looking forward to a few long evenings sipping a glass of white wine and a bit of extra heat to keep those old bones warm! The first Gold Chart is one I created for the original Golden Parabola editorial that showed my expectations at the time for Gold to bottom at the 34 week EMA with a potential target for Gold into mid-year per the 1970’s Gold Bull up to around the $1860 level. On the chart, below, I have now added a blue line off of the tops since the 2008 Deflation Scare low showing a potential for Gold into mid-year to around the $1860 price level, which appears to confirm the earlier chart. The chart also shows that Gold has busted out to new historic highs with no horizontal resistance above and with no real angled resistance on the chart until much higher price levels are reached. The second chart shows Gold rising up through the same angled dotted line that it rose through back in 2006 on its way to the upper black solid line of the channel top which will be around the $1920 level into mid-year. This chart also includes a black dotted line above the channel line that mimics the extent that Gold overshot the channel on the down side into the Deflation Scare Bottom into late 2008. Since the necessary Dollar Inflation to deal with the larger current level of debt is so much larger today versus the late 70’s, is it possible that Gold will overshoot the upper log channel on the upside to the extent it overshot the channel bottom on the downside? If so, then a higher target for Gold might come into play. The third Gold chart shows a distinct channel for each “Phase” or Elliott Wave rise in this current Golden Parabola. We can see that Wave I was basically held in the smaller flat blue channel into late 2005. After Gold broke out of that blue channel it moved into a higher sloped rise into the green channel that approximates Wave III in the current Golden Parabola. We can see on the chart that Gold has now busted up through the top of the Green Channel firmly into the Red Channel which appears to approximate the higher sloped Wave V advance. I had suggested some weeks ago to the subscribers to my service (see here for details) that a rise above the black dotted line on this arithmetic chart might herald in a very sharp rise in price into mid-year, and that appears to be in motion. We can see a similar bust out of the Wave I Channel into the Green Wave III Channel back in late 2005. That move in late 2005, up and out of the Wave I blue channel, was basically “phase transition” into Wave III if you want to use that term. Similarly, the current bust out of the Green Wave III Channel into the Red Wave V Channel appears to be the phase transition to Wave V in progress – a transition to a true higher priced slope of rise for the Golden Parabola. The final chart for Gold is “Fractal Gold Vs Armstrong’s Economic Confidence Model.” I have placed a dotted red line to the right of the sold red vertical line in the coming period to denote the actual June 13th turn date that Mr. Armstrong has proposed. We can see that the Gold price is running hard and higher toward his turn date as it did into the last 2 similar turn dates represented by the solid red lines on the left hand side of the chart. We can see that the TA Indicators which are simply tools to measure the health of the rise of Gold suggest that higher Gold pricing into the June 13th turn date appears probable. The current Golden Parabola has been tracking the Golden Parabola of the 1970’s almost perfectly for over a decade. Today’s Golden Parabola is driven by the parabolic growth of the U.S. Dollar Inflation in response to the massive backdrop of debt that exists, today. We can project price targets as the Golden Parabola grows, but its final height will be determined by the necessary price level for Gold to balance the U.S. budget once all of the liabilities of the U.S. are eventually placed on its balance sheet. Many of those liabilities will not be transferred to the U.S. balance sheet until late in the Golden Parabola’s rise in an attempt to compress the level of discomfort in terms of time that the Dollar Devaluation will create. Thus, it appears that at this time the terms “Bubble” and “Gold” do not belong in the same sentence. If you take a look at the chart for Silver you will start to get an inkling of what is to come for the Gold price. It appears that we are just entering the higher sloped rise in Gold that has already begun in Silver; and Silver still has a much higher path to climb into the future. There is no doubt that Gold has made a nice run since the original Golden Parabola article, but I expect the run to continue into mid-year. As a quick note on the PM Stock Indices, this analogous break-out of Gold ushered in higher valuations for the large cap PM stocks in the late 70’s. The PM stocks tend to be re-valued higher in short dynamic spurts, and I am looking for one of those spurts higher for the PM Stock Sector to commence with this break-out in Gold. I hope to return with an article on the PM Stock Indices in a few days. 1. Increased government intervention in financial markets (bank bailouts) and aggressive monetary policy (cutting rates in financial panic) to keep economic growth steady and recessions & bear markets brief. 2. Economic interdependency between the US and BRIC markets. 3. Increased government spending for things that create economic growth but are not necessarily socially popular such as war, national security, bailouts, stimulus, and tax cuts. 4. Disregard for US dollar and deficits by policy makers. A lower dollar combined with low rates makes the deficit less burdensome, while falling dollar helps multinationals. This spending is subsidized by foreign governments. 6. Two-track inflation characterized by low core CPI and low treasury yields, but steadily rising cost of living inflation due to relentless global economic growth, permanently low rates, and to a lesser degree price gouging & speculation. 7. An economic system that seems to exclusively benefit the ‘elite’ and multinationals though globalization and low borrowing rates. 8. Fed keeping the foot on the gas even during strong economic expansion and only releasing the gas pedal very slowly. It’s not like the 80’s and 90’s interest rates were high as the economy boomed. 9. Breakdown of Okun’s law (decoupling of employment and GDP). What this means is economic output is unaffected much less today & in the future by high unemployment than in the past. 10. Dollar-denominated assets (oil, euro, gas prices, high-end real estate, metals, grains, stocks, web 2.0 company valuations) rising and falling in lockstep with the stock market. This is in contrast to the 80’and 90’s when commodities, the dollar, and stocks showed little correlation. Contrary to popular belief Alan Greenspan didn’t hurt the economy by keeping ‘rates too low’ but was instead adhering to dyseconomics which gave him the luxury of leaving rates low for an extended period. The media would have you believe that had Bush and Greenspan been more fiscally conservative the economy would have been better off by preventing the 2008 recession. The media is wrong because when the stock market crashed, so did PE ratios falling from a high of 22 in 2007 to the low teens. If the fundaments were in trouble PE ratios would have risen or stayed the same as what happened in 2001 when the PE ratio of the S&P 500 actually hit a peak of 47 after the crash due to falling earnings. At the peak of the technology bubble the S&P 500 had a PE ratio of nearly 35 with the index at 1,500; now it’s at 1,300 but the PE is only 23 so you could extrapolate that if it were valued at the same level it was in 1999 it would be at over 2,600. That 1,100 point difference (even after the 2008 recession) is pure earnings that can be attributed to market friendly economic policies of the past decade. As of March 2011 median US home prices are slightly lower than they were in early 2009, but GDP & profits have recovered markedly lending further doubt to the supposed correlation between the housing market and overall economic strength. Greenspan may have helped inflate a big bubble, but when it burst the S&P 500 felt it only modestly (in terms of profits & earnings). During Greenspan’s 18-year tenure the US economy was in recession for only 16 months, and even after the 2007-09 recession the total duration was just 34 months over the past two decades. Remember the infamous Clinton surplus? The economy entered a recession on it, further dispelling the notion that high debt implies an unhealthy economy. High interest rates, relatively high personal savings rate, lack of spending contributed to it. 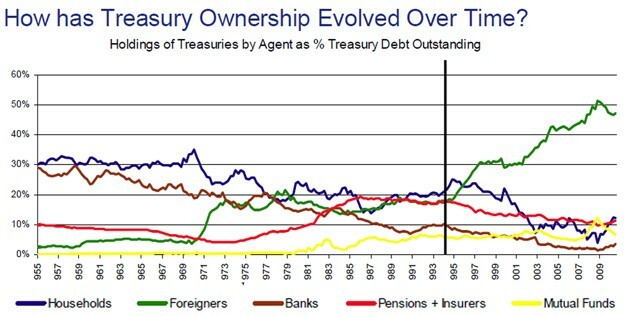 Essentially, money began stagnating the late 90’s as the country became a giant piggybank. Then came the dotcom crash, Iraq and Afghanistan wars, massive tax cuts, low rates, and the BRIC economic boom. These events prevented what could have been a repeat of Japan’s multi-decade economic malaise. Corporations were once again flush with cash and began reporting larger profits & earnings than ever. As you can see from the chart below during the 90’s PE ratios gradually rose in tandem with the S&P 500, eventually peaking AFTER the market plunged! Since 2002 there has been a divergence meaning that earnings are so good that PE ratios fell despite stocks rallying. Therefore, you can surmise that the economic fundamentals in the past decade (under the least popular president and fed chairman) till the present are better than they were in the 80’s and 90’s, but you won’t hear that from the media. 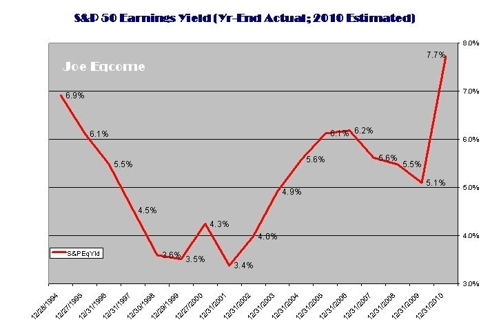 S&P 500 earnings growth rivals that of the 90’s according to the chart http://static.seekingalpha.com/uploads/2010/6/11/283299-127626464876247-Joe-Eqcome.jpg earnings yields for the past decade matched or exceeded that of the 90’s and presently at the highest rate since 1994. GDP calculations don’t fully reflect this growth due to the trade deficit deduction, which has become irrelevant as deficits haven’t been shown to be inflationary and economically detrimental. Fund managers know this and that is why the S&P has doubled even though GDP growth is only at 3%. Furthermore, projected United States GDP growth for 2011 exceeds that of any country in the Eurozone. Job creation, small business, and housing will have to sit on the sidelines in this boom. Small business is unable to take advantage of low cooperate bond rates, pricing power and globalization that multinationals enjoy and there’s nothing the government can do to spur more hiring or small business expansion that isn’t already being done. We constantly read on the blogosphere and to a lesser extent in the main stream media in 2008 and 2009 about how the bank bailouts would lead to moral hazard and a Zimbabwe like hyperinflationary scenario. While risk taking is making a comeback, there was no hyperinflation. Short term yields are hypersensitive to financial shocks allowing bailouts and infusions to be made with impunity. The cost of TARP according to the bond markets was essentially free and it would have been reckless for policy makers to not take advantage of this opportunity. Letting the banks ‘run wild’ can create volatility, but it’s easy to remedy by ‘printing it away’ as was shown in 1987 black friday, 1998 LTCM and 2008. The 2008 financial crisis, while deep, was brief thanks to the expediency of Bernanke, Geithner, Paulson, and G.W Bush. Risk tasking should be encouraged because it creates innovation and when things do, on occasion, go badly it’s pretty easy to fix the problem due to ‘free money’ in the form of perpetually low rates. In retrospect the Bernanke TIME man of the year nomination was justified when you look at how well the stock market and economy has done in the past two years. Dyseconomics is not Reaganomics in that ‘reckless’ government spending is almost encouraged because it’s subsidized by an insatiable demand for US treasuries by BRIC and public & institutional holders, thus allowing deficit fueled growth without upsetting the bond vigilantes. This is evidenced by perpetually low 10, 30 year treasury yields. Until GWB came into office the BRIC was in its infancy and income taxes and interest rates were raised on numerous occasions out of necessity. The rise in BRIC economies, more specifically BRIC surpluses, correlates negatively with long term rates. The republican and libertarian fears about tax hikes because of the bailouts & stimulus were unfounded and still are. Despite the bailouts, two wars, and stimulus income taxes have not increased a single penny since Clinton’s tax hike and they will probably never increase again thanks to huge demand for treasuries. 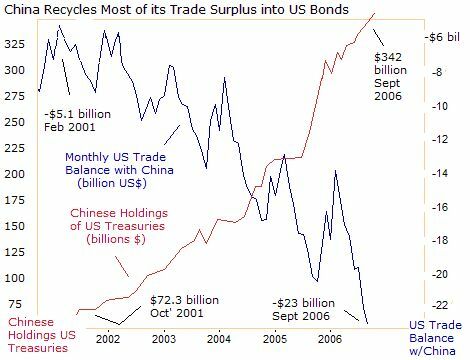 What about China dumping treasuries? Japan and China, whose economies depend on exports aren’t going to begin a trade war by dumping treasuries, so the politically unpopular trend of foreign government helping to subsidize ‘reckless’ spending will continue. The DJIA is poised to hit 17,000-20,000 within the next 2-3 years. By the time the interest rate cycle peaks at 4-6% the DJIA may be well above 50,000. The S&P 500 has already doubled from its March 2009 lows and interest rates still haven’t bunged. Bernanke may finally raise rates by a quarter or half point when the DJIA crosses 15,000. Will there be a repeat of the 2008 commodities crash now that prices seem overheated again? Odds are no. It just so happened that the financial panic coincided as oil hit $150. The failure of several financial institutions, decline in confidence and the resulting stock market crash had nothing to do with oil. Unless there is a double dip commodities will continue their upward trajectory due to huge global demand, speculation, low rates. The unpopular truth is that surging commodity prices will not hurt growth, but may actually increase growth by forcing people to reduce their personal savings to purchase inelastic goods. What if the fed begins to raise rates? Will this cause stocks and commodities to crash? No. Between 2004-2006 commodities, stocks, and interest rates rose together because rates were low relative to the expected/anticipated rates. When Bernanke does eventually get around to raising rates the rate hikes will be well-anticipated according to various prediction markets. Rate hikes cause deflation when they are unexpected and exceed the federal funds forecast rate. The Facebook IPO will be a resounding success with the valuation rising to $200 billion within the first few months of trading. But it won’t be a bubble due to huge growth from facebook ads and its initially high PE ratio will rapidly contract as was the case with BIDU, GOOGLE, OPEN and other successful internet IPOs. The groupon and potentially a twitter IPO will be a similar success. Usually what seems like a bubble isn’t. Remember the China economy ‘overheating’ talk of 2006? Or how Priceline, Netflix, and Baidu were overvalued last year? Those things still keep going strong and will continue to do so as long as the fundamentals of the economy remain strong. Surging commodity and living expenses will result in even more populist angst (if that’s even possible), but have no negative impact on economy. The demand for food, energy, healthcare, education (the stuff rising the most) is considered to be inelastic. But the increased spending on these inelastic goods will translate into pure top line GDP growth without impacting elastic goods such as computers, appliances, and apparel. Thus, surging living expenses helps the economy and stock market by forcing consumers to spend more on these inelastic goods. The personal savings rate will fall into negative territory like it did in 2008. We’ll see $5/gallon gas, $2000+/ounce gold, $150+ oil and parabolic charts for grains. 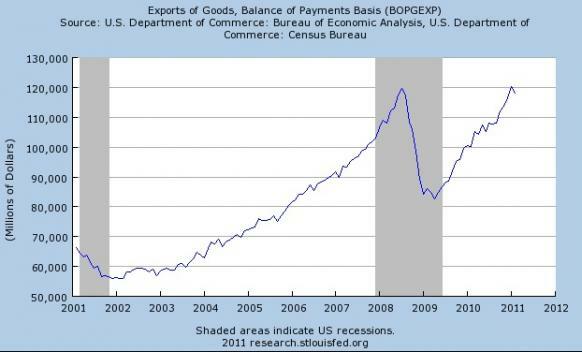 Unlike in 2008 there will be no collapse; non-core components of the consumer & producer price index will keep rising, but treasury yields will rise only slightly confounding many of the experts like Peter Schiff who have been pounding the table about an impending ‘dollar crisis’ and hyperinflation. Technically there inflation, but it’s non-core inflation, which is the kind Bernanke and the bond market ignores. Healthcare and college tuition costs will not relent. There will be no popping of the credit card or tuition bubble. The seismic shift in the labor market in the past decade to more technical, specialized jobs is contributing to the college boom. Companies that are market leaders today such as Facebook, IBM, Netflix, Apple, or Google will remain so long into the future. Large cap, globalist companies and high net worth individuals are the main beneficiaries of current economic policy. The system is one that seems to help those who have the most. if you’re out of college and have a lot of debt or out of a job don’t expect much help from the government. It’s a nation of huge personal debt but huge S&P 500 profits, too. The wealth gap will keep widening and wages continue will lag inflation. Healthcare, education, student loan debt, gas, energy, food will keep skyrocketing. It’s not fair and there’s nothing anyone can do about it. Buying and holding stocks, Euro, and commodities is one way to profit off dyseconomics. Or emigrate before the purchasing dollar becomes nonexistent and you’re stuck. High unemployment has been shown to have a negligible to non-existent impact on consumer spending. Ref (http://www.savingpontiac.org/images/torturethenumbers.pdf ) According to msnbc Consumer spending was growing at the fastest pace in four years in the final three months of 2010 The S&P 500 consumer discretionary spider is well above its 2007 pre-recession highs. But the economic gains from high unemployment cannot be dismissed in the context of dyseconomics. High unemployment gives the fed a good excuse to never raise rates that the public will buy (the real reason is BRIC surpluses as explained earlier). High unemployment makes the remaining workers more productive which means higher profit margins. When consumers are less confident they are more productive, but still spending the same amount of money on essentials like gas and food as well as ipods, Netflix, Priceline etc. Spiking consumer confidence could be a bearish indicator for the markets. Finally, any weakness in American consumer & business spending from high unemployment is easily compensated by growing foreign business & consumer demand, and combined with a falling dollar you have a win-win situation for S&P 500 exporters. It’s not like the 80’s and 90’s when foreign markets were much smaller. For the aforementioned reasons policy makers aren’t expressing much enthusiasm for getting people back to work. Also, No one can ‘force’ companies to hire more people. NO publics works, no shovel ready projects. Wall st. and the fund managers don’t care about unemployment or housing because the economy in terms of earnings, exports and profits is doing great. That’s what matters from an investor’s standpoint. If you’re a trader a failsafe strategy is to buy the dip of any job news related selloff. Unemployment will remain above eight percent for remainder of the decade, and may exceed ten percent if more people look for jobs. Their efforts will prove mostly futile as outsourcing, productivity, and technology means fewer workers needed. The baselines unemployment will settle at 7-8% and the total US labor force will continue to shrink. Structured labor tracked by the government will continue to be replaced by underground work. Even with mainstreet is sitting on the sidelines the US economy now is stronger than it was at any other time in history thanks to dyseconomics. Permanently low interest rates combined with booming earnings and profits makes for a formidable bull market. Copyright © 2011 Cetin Hakimoglu – All Rights Reserved Disclaimer: The above is a matter of opinion provided for general information purposes only and is not intended as investment advice. Information and analysis above are derived from sources and utilising methods believed to be reliable, but we cannot accept responsibility for any losses you may incur as a result of this analysis. Individuals should consult with their personal financial advisors. I have a note on core inflation which might be of interest to your readers. Imagine that the measure of inflation used by the Federal Reserve excludes ENERGY and FOOD because they are TOO Volatile. We truly live in a FIXED world. “Core inflation is a measure of inflation which excludes certain items that face volatile price movements, notably food and energy. The preferred measure by the Federal Reserve of core inflation in the United States is the core Personal consumption expenditures price index (PCE). This is based on chained dollars. The oppressed people will eventually be able to push aside their oppressors, throughout the history of mankind this has been the case and it will come to pass in Syria and in the rest of the Arab world it’s just a matter of time! CHICAGO, April 26, 2011 /PRNewswire/ — CME Group, the world’s leading and most diverse derivatives marketplace, today announced it had reached record volume yesterday in its COMEX Silver futures, as well as in open interest of its Silver options. Yesterday, trading of Silver futures reached 319,204 contracts, surpassing the prior record of 201,216 contracts set on November 9, 2010. At the same time, open interest in Silver options reached a new record of 240,344 contracts. The prior record of 235,992 contracts was set on April 21, 2011. Silver futures have demonstrated rapid growth during the month of April. Month-to-date average daily volume (ADV) for Silver futures has increased 218 percent from this point last year. During 2011 year-to-date, ADV for Silver futures have grown 110 percent versus the same period last year. I wonder if we are going to see a major correction in this particular commodity soon before it goes on toward the 100 mark?? Figures released by the Central Bank of Ireland (CBI) this morning for the month of March 2011 show that the flight of deposits from Irish banks shows no sign of slowing down. From an Irish perspective, possibly the most significant figure to watch is the total of private sector deposits in the six State-guaranteed financial institutions (AIB, Anglo, Bank of Ireland, EBS, Irish Life and Permanent and INBS). The total which represents businesses and households fell to €106.3bn in March 2011 from €108.6bn in February 2011 and is now down €23bn from a year ago, €11bn since the IMF/EU bailout in November 2010 and €2.3bn down over the course of just one month. The CBI and ECB continue to provide substitute funding for Irish banks which replaces this flight of deposits and Irish banks continue to provide extensive State-backed guarantees on deposits. It remains to be seen if the pace of decline in deposits slowed after the bank restructuring announcements made after close of business on 31st March, 2011 – Minister Noonan indicated the early signs were encouraging but since then our sovereign bond yields have sky-rocketed again. So, looking at the deposit figures produced by the CBI. First up is the consolidated picture for all banks operating in Ireland including those based in the IFSC which do not service the domestic economy. Next up are the 20 banks which do service the domestic economy and include local subsidiaries of foreign banks like Danske, KBC and Rabobank. There is a list of all banks operating in Ireland here together with a note of the 20 that service the domestic economy. (1) Monetary Financial Institutions (MFIs) refers to credit institutions, as defined in Community Law, money market funds, and other resident financial institutions whose business is to receive deposits and/or close substitutes for deposits from entities other than MFIs, and, for their own account (at least in economic terms), to grant credits and/or to make investments in securities. Since January 2009, credit institutions include Credit Unions as regulated by the Registrar of Credit Unions. 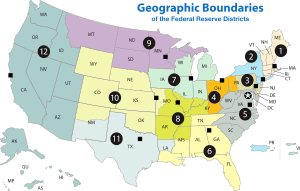 Under ESA 95, the Eurosystem (including the Central Bank ofIreland) and other non-euro area national central banks are included in the MFI institutional sector. In the tables presented here, however, central banks are not included in the loans and deposits series with respect to MFI counterparties. Just a few weeks ago Mr. Noonan reassured the public that “The total amount of deposits withdrawn from the pillar banks has been very significantly reduced”. And “the net deposit position of the Pillar Banks has improved significantly” So what’s new he was lying and I expect he will continue to lie to us over the next few years. This is what you get when you try to build so called Pillar Bank on the rotten foundations of corrupt and toxic banks in the first place! Shut these toxic black holes down now!